Sansevieria is now famous for their many emit negative ions. 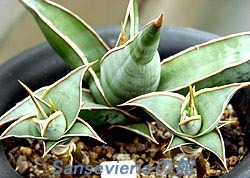 After that, I understand that many people start growing the Sansevieria is also happy for me as I like Sansevieria. I brought up Sansevieria from the past 10 years ago. but I forget to take in the house of winter and mustard Sansevieria. That Sansevieria was a kind of Laurentii are sold to the general. Next year, I thought trying to buy a new one from loneliness, and I saw many kind of Sansevieria in internet. What? "Sansevieria is so there different types? " It was first time I knew of its existence. So, I worked to obtain them immediately. And look at them, I was very interested in the depth of Sansevieria. Anyway, what is also in other plants even so different form the same Sansevieria? So, I searched Sansevieria wanted to know more in internet, but I knew very little HP and professional information about Sansevieria, then I created a this HP I try to put such information and wisdom that I have examined. Im a doctor of trees, but I think about Sansevieria are still amateur. I will write to HP, I would like guidance if you have any opinions of seniors. Please contact me from below "Contact" if you like. Then, someone who would like to grow Sansevieria, who are in trouble have about Sansevieria, and dont matter at all even for beginners. Please contact me freely from below "Contact" if you have a question. I will reply in detail as much as possible by email. In addition, if no reply is received it is often hanging on the email message filter when you sent "Contact". Please ask that you send has been set to permit reception of "sansevieria@liilil.com" receive email on mobile or PC settings before the "Contact". However, you can't receive if E-mail address is wrong, and if you don't write real name, I don't answear. please understand. I think I want to introduce the results of trial and error that I really want to grow as same Sansevieria in field I got any Sansevieria, in Japan. They are of course, that the amount of solar radiation and photosynthesis, necessary amount of nitrogen, root growth, soil, such as component elements is necessary for the growth, but not yet organized. I will add more information in "Reserch of growth", please visit there. In the climate of Japan and In the environment can not be other than grow potted, I bigan to grow up as much as local is what to do. As a result, I guess that can be grown very well. To say that local, its not mean Ive seen and been there, Its the result of comparison while try to look at the many images in internet. Its not mean to be big meaningless. If elongated leaves or form had collapsed, its not valid. Two baby came out in one month to obtain Pinguicula. Then, 4 months later that has grown up to half size of the parent strain. * As the following, this HP is "Copyright". * Please contact me from below if you are linked.